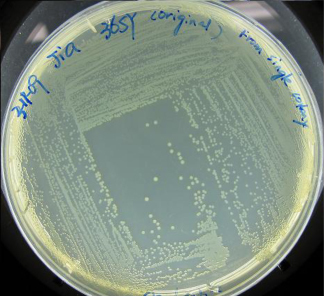 Petri plate streaked with a pure colony of the 36-SY bacterial strain possessing, to a degree, the heat-tolerant quality required for the Saudi Aramco project. The strain was isolated by an IIT student from a soil sample taken in the Chicago area. It seems fitting that a small plaque displaying Chicago architect Daniel Burnham’s quote “Make no small plans; they have no magic to stir one’s blood” secured a spot atop the crowded desk of Benjamin Stark, associate chair and professor of biology at IIT College of Science and Letters. Stark and his team of collaborators and student researchers are involved in a big undertaking with an equally big corporation Saudi Aramco, the state-owned national oil company of Saudi Arabia. Stark was awarded a two-year $560,000 grant from Saudi Aramco to genetically engineer a sulfur-eating bacterium to help clean the petroleum it produces. By removing the sulfur, Saudi Aramco would help to reduce the amount of acid rain produced by the burning of petroleum. Sulfur also corrodes the equipment used in the refining process. While chemical methods currently exist to remove the organic sulfur, it may turn out to be more cost-effective to use bacteria to break apart the naturally occurring sulfur-containing compounds and thus remove the sulfur from the petroleum, or at least lower the sulfur content considerably. Saudi Aramco produced 3.2 billion barrels of petroleum, or crude oil, in 2008 and managed nearly 260 billion barrels of crude oil and condensate reserves. 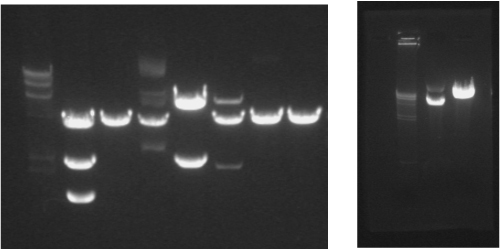 Agarose gel showing bands (DNA fragments) containing the genes that encode the enzymes that catalyze the desulfurization process. Other bands indicate an extra gene added by the IIT team that may enhance sulfur removal, and a DNA molecule vector that is used to carry the extra gene. The goal of the IIT team is to combine together features of various bacteria to create one that is optimal for Saudi Aramco’s needs: to eat sulfur at a five- to 10-fold rate faster than what takes place in the laboratory and at a temperature of about 60 degrees Celsius (140 degrees Fahrenheit). One current focus is on obtaining versions of the genes that encode the three enzymes, or proteins, responsible for the sulfur-eating property that are able to function efficiently at 60 degrees C. To isolate such genes, IIT students took soil samples from around IIT’s Main Campus while Saudi Aramco scientists took their own samples from the desert. Both groups were in search of a bacterial species exhibiting this quality. A parallel search is on for a bacterial species that can thrive at 60 degrees C, that lends itself to genetic engineering, and that can be easily reproduced. One of Stark’s students found such a strain that the group is now using in the project. A longtime distance runner, Stark has the patience and endurance to continue working to find just the right combination of genes. Editor’s Note: Benjamin Stark’s chief collaborator is IIT Research Professor John Kilbane, who proposed the biodesulfurization project to Saudi Aramco.